Block Engineering's LaserWarn is an open path gas detection system based on patented quantum cascade laser technology. LaserWarn detects chemical threats, leaks, and fugitive emissions over a coverage area of thousands of square feet, and can be used in both indoor and outdoor applications. Eye-safe laser beams and low-cost retroreflectors provide real-time, 24/7 early warning of Toxic Industrial Chemicals (TICs), Chemical Warfare Agents (CWAs) and other chemicals. Any target gas crossing the lasers, even at low concentrations, will be detected with a sub-second response time. The system requires no consumables, and is low maintenance compared to conventional networks of point sensors. Both fixed-site and portable configurations are available. In fixed-site installations, the LaserWarn is positioned with mounted mirrors and retroreflectors to cover large areas, including perimeter monitoring of facilities. Portable configurations allow the LaserWarn to be brought to the boundary of a "hot zone" while reflectors are safely introduced to scan for chemical contamination. Unlike conventional open-path IR and FTIR systems, the LaserWarn is able to detect chemicals at great standoff distances (standard range of 500 meters). The system requires no liquid nitrogen or other consumable cooling mechanism. An extremely wide range of gases are detectable, and at a weight of 5 kilograms, LaserWarn can be easily relocated and reprogrammed for rapid detection of new threats. 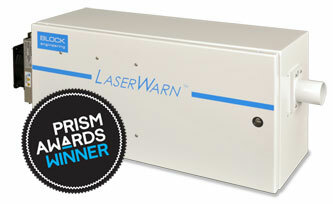 The Quantum Cascade Laser-based technology behind LaserWarn provides significant advantages over competing technologies. LaserWarn provides much larger detection distances and greater sensitivity than conventional IR and FTIR systems. The system detects a wide range of gases, and requires no regular maintanance. If you would like to discuss how our open path chemical gas detection system can help with your application needs, please contact us. For over 60 years, Block Engineering has been a leader in chemical detection and gas analysis technology. We welcome the opportunity to speak with you about our Quantum Cascade Laser and FTIR products. © Block Engineering, LLC. All Rights Reserved.